Page revised in February 2017. You may wish to see an introductory page to this section or page one first. 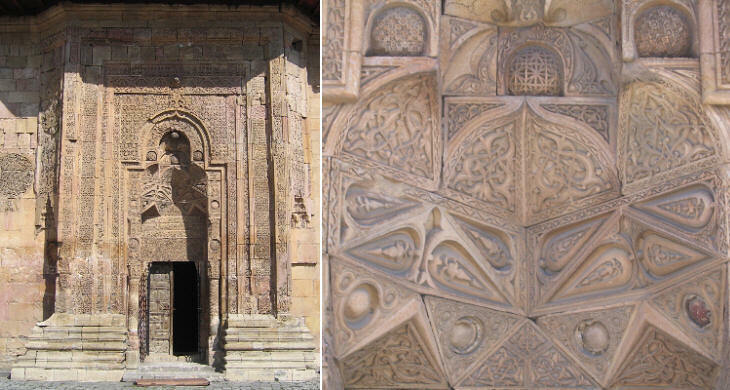 Hurrem, the architect of the Great Mosque of Divrigi came from the region of Lake Van; this was located at a crossroad of different cultures: to the north it bordered on Armenia where elaborate and deeply carved gravestones were developed between the IXth and the XIth century; Persia lay to its east; this meant influence of a culture which had exchanges with India; to the south there were some remnants of the Christian states founded after the First Crusade: here elements of Gothic architecture were introduced; finally Lake Van was close to the eastern border of the Seljuk sultanate. 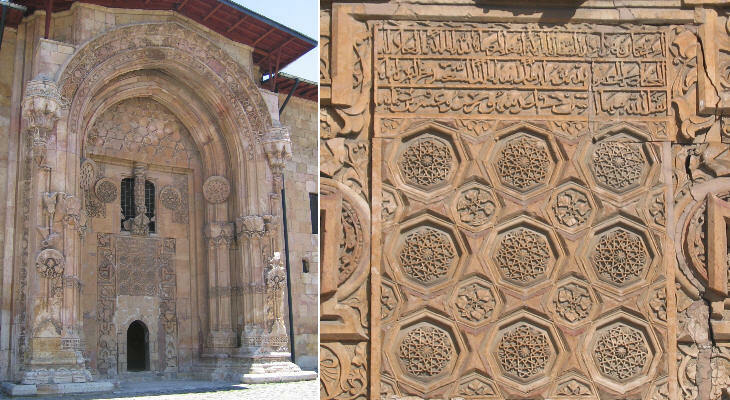 Hurrem built three gigantic portals; two for the mosque and one for the hospital; although the portals were designed by the same person and were built at the same time they show great differences. The northern portal is characterized by its great depth and by the unusual design of its muqarna, the system of projecting niches above the actual entrance. 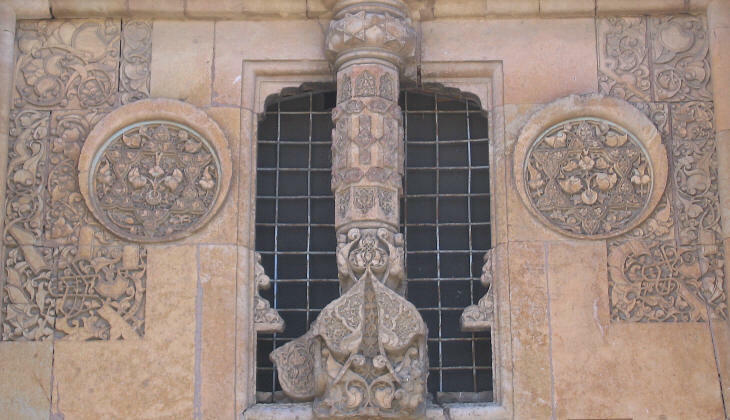 Floral motifs are common in Muslim art; they are usually associated with geometric motifs and calligraphy: the overall effect is very elaborate. In Divrigi floral motifs are an explosion of life; they are very detached from the background and actual plants seem to climb on the walls. Art historians have identified points in common with Indian monuments and even with the contemporary temples of Angkor. The western portal is less deep and at the same time it projects more from the wall than the northern one. Its muqarna is based on complex curved lines and is characterized by several spherical objects. 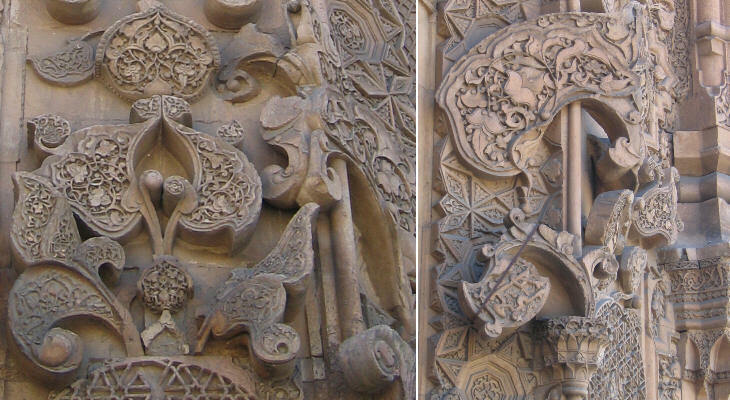 Art historians attribute to Armenian influence the capitals and the design of the columns at the sides of the entrance. The representation of birds is linked to the male (eagle) and female (dove) concepts, but the two-headed eagle was also a symbol of power and of the Sultanate of Rum; when the complex of Divrigi was built the Menguceks were vassals of that nation. The technique is very unusual because the birds are clearly detached from the background, but at the same the relief showing their details is very low. The high portal of the hospital is characterized by two pointed arches, one set within the other. This gives to the portal an almost Gothic aspect. It is known that astronomy was held in great esteem by Islam: this is confirmed by the representation of many stars above the entrance. The encircled six pointed star is usually associated with Jewish identity. For Islam this star was associated with the number of days in which God created the Earth and it was regarded as an excellent shape. The Shield of David is not mentioned in antiquity nor is it found on ancient Jewish gravestones. It appears to be associated with Jewish culture from the middle of the 12th century, so when the stars of the portals were designed they did not have any hidden reference to Jewish identity. The floral motifs decorating the portal of the hospital are not as many as those of the northern portal, but they show the same vigour. The mosque can be accessed through a third entrance: it was reserved to its founder and thus it is called the Shah Gate. 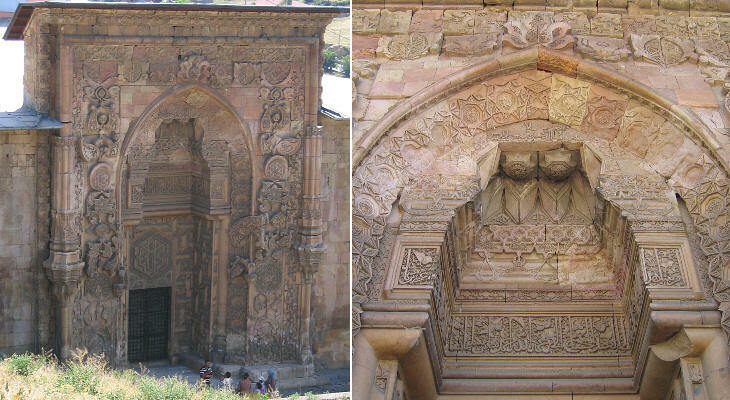 It was built in 1241 and it strictly adheres to the canons of Seljuk architecture; this maybe because the other entrances were regarded as being somewhat heretical owing to their representation of actual flowers and animals. While Sivas is located in the basin of the River Kizilirmak which empties into the Black Sea, Divrigi (which belongs to the province of Sivas) is in a different basin. The river which flows near the old town finds its ways through a ridge until it reaches the western branch of the Euphrates River. This flows through steep canyons and gorges and then through the deserts of Syria and Iraq until it merges with the Tigris; the resulting river (Shatt-Al-Arab) empties into the Persian Gulf. Today's Turks see their country as a bridge between Europe and Asia; the easternmost arch of this metaphoric bridge ends at Divrigi.